Happiness, optimism, enlightenment: three words I would use to describe the color yellow. Not the traditional office of a professor, nor any office for that matter. Yet, as I opened the door to this Padelford office, I was immediately welcomed by the warm yellow paint on the walls. They almost seemed to be inviting creativity and offering a space to be bold and expressive. Within these walls sits Professor María Elena García. A warm, welcoming professor whom the Honors community will soon get to know very well. Dr. María Elena García, at home in her colorful Padelford office. Dr. García is just at the start of her 2-year Hanauer Honors Professorship, an award that supports course development and community building within Honors’ interdisciplinary community, to improve understanding of concepts related to western civilization. 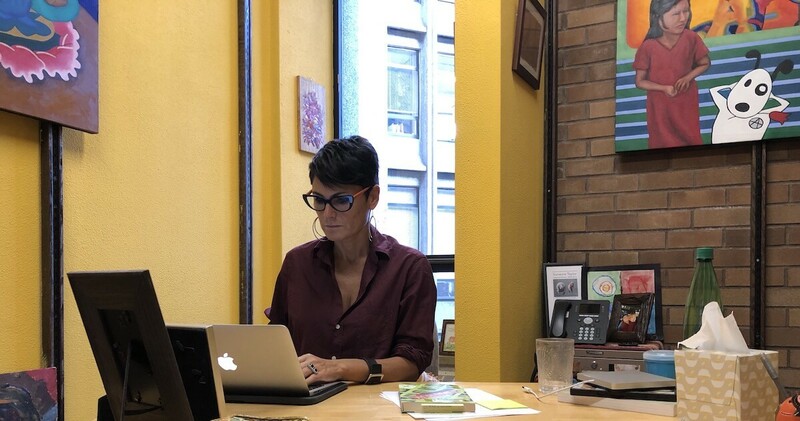 I was recently given the opportunity to have a talk with Dr. García and learn more about the wonderful professor who chooses to surround herself in yellow. How would you describe your academic journey? I started high school in a place where I got a lot of questions showing deep-seated racial and cultural stereotypes and demands for me to label myself. This made me think about really being Peruvian. I became Peruvian in Virginia, where I realized who I was mattered to a lot of people. Unfortunately, my family was not able to return to Peru due to the war which ultimately led to me wanting to know more about the war. I began to learn about the disproportionate impact war has on indigenous people in Peru which I think led me in the direction of Anthropology. Then, in college, I met an amazing professor, an archaeologist doing work in Peru, who took an interest in me and pushed me to think about grad school: something I had never even considered before. Well, indigenous cultural politics was my entry point to academia, and I continue to do work in that area. However, while at Sarah Lawrence College in New York, I got into a discussion with a colleague of mine who was writing about the history of the lab mouse. After a long conversation about the mouse she asked me why I didn’t just teach a class on animal rights. Initially, I laughed, but I couldn’t shake the idea and it pushed me to think about non-human life more and more. It eventually led to me teaching a class I called The Anthropology of Animal Rights. Rather than ending with the class, the things I learned have played a role in shaping my life, my teaching, and my research. What brought you to UW? To Honors? What brought me to UW, actually, was that my partner and I were at different institutions and UW offered the possibility of having jobs together here. After applying and interviewing, I was struck by the Comparative History of Ideas department (CHID) and how it was a small cohort in the middle of a large, public research institution. I enjoyed seeing how close-knit the CHID department was, including faculty, undergrads and even grad students, and I was excited to possibly work here. I was brought into Honors through a study abroad program I created with some of the Honors faculty and I thoroughly enjoyed my experience. My students were from all different disciplines and engaged in conversations that opened up more conversations rather than shutting them down. Also, the relationships between people in Honors is something that I value. Just seeing how engaged the community is makes me excited to continue working with Honors. In Honors, we really value being an interdisciplinary thinker, learner, and person overall. How have you continued to see the world and your work through an interdisciplinary lens? I think I’ve always been an interdisciplinary thinker, although I don’t think I would’ve known to call it that. My department in my undergrad years wasn’t very diverse and I ended up reaching out to the Center for Latin American Studies. Here I was able to meet professors and other students. And, before I knew it, I was spending more time with historians and people studying literature. Looking at the world through multiple vantage points is, for me, much more exciting and interesting than simply looking at just the discipline. Still, I am much more interested in thinking with others, and I try to always include material from across disciplines in my classes. What does the Hanauer Professorship mean to you? Intensified collaboration, working with the community and the opportunity to create some new classes and conceptualize some new works. I am interested in looking at the human, a title that all people have not been able to have throughout history. Through Hanauer, I was able to create my Spring Honors course: The Making of The Human. I pitched my Hanauer application as looking at how the very idea of western civilization has led to violence, dispossession of bodies and the idea of the human to begin with. I want to unpack that and begin to think through different histories with the people in class. It means having the space and time to push back against the notion of western civilization. In what ways are you excited to work even more closely with the Honors community? I am very impressed with and excited about the research being done in the Honors community. I look forward to continuing to support students and becoming more involved with all of our students. Honors puts on events and hosts nights where we are all able to get to know students better and that is something that I have missed doing and look forward to. Opportunities like that are really special to me. What free time? But seriously, I have a young son who I love spending time with. After school on Mondays he has dinner club, where he and his friends make dinner for the family. He loves feeling like he contributes through his dinners. I love to cook as well, so that is something that we have been doing together. What is one piece of advice you wish you could give your undergraduate self? I would tell myself to find a way to study abroad. Back then it didn’t cross my mind, but now I wish I had. While I have lived in many different places, I think there’s a difference when you have the experience of traveling with different peers and faculty around you. Dr. García smiles and laughs with me throughout our discussion. She is involved with many different disciplines on campus and the many different facets of her research demand lots of attention and time. And she is real. Very grounded in the moment and each thing we both had to say. Our conversation touched on many different aspects of her personality, background and life, as opposed to just academia. Dr. García mentions how seriously she values relationships in her professional life and I am positive she meant that. Happiness, optimism, enlightenment: three words I would use to describe my feelings towards the Honors program and our wonderful, new Hanauer recipient. I am happy Dr. García will be working alongside our students because she truly cares for students. I am optimistic when I think of all the things Dr. García mentions in our discussion about what she hopes to accomplish in Honors. And, I feel enlightened after having spoken with a professor who values critical thinking and collaboration as much as Dr. García. Honors community, you should too. Izaiha Linton is a junior in the interdisciplinary Honors program, majoring in English with a minor in diversity. He is also a McNair Fellow, working with the UW Pipeline Project and conducting original research to help other mixed-race people better understand the world around them and feel represented in scholarship that often excludes the experiences and realities of mixed-race communities.